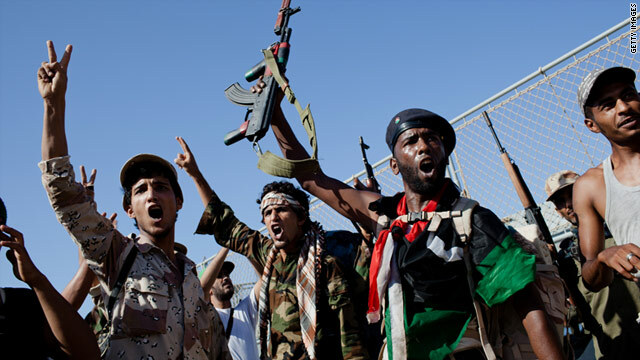 Libyan rebel fighters celebrate as they arrive in Tripoli on an ex-Libyan Army frigate on Tuesday. Are you there? Share your photos and video, but stay safe. (CNN) -- Ten days ago the vanguard of rebel forces streamed into the Libyan capital. Moammar Gadhafi's forces put up virtually no resistance, and it seemed that the end of Libya's six-month conflict was imminent. The people of Tripoli could smell freedom; there was an anarchic euphoria about the city despite continuing gun battles. Today the picture is less clear, and the future holds many questions. The joy at being liberated from Gadhafi's brutal and capricious rule is still unconfined, especially as residents celebrate the end of Ramadan. Security in Tripoli has improved, but the humanitarian situation remains precarious, with water shortages especially a problem. The National Transitional Council's political leadership has not installed itself in any organized fashion as a government-in-waiting and there appears little command and control over the disparate groups of fighters consolidating their hold on Tripoli. There also seems to be an emerging dispute within the NTC over who administers Libya's enormous sovereign wealth fund, while relations with neighboring Algeria are not exactly stellar. Much of Tripoli's water comes to the capital through a 1,700-kilometer pipeline from an aquifer deep in the Sahara desert, an area that is apparently still under the control of pro-Gadhafi forces. Basically, they have sabotaged the flow. The massive holding tanks to the south of Tripoli are said to be virtually empty, and 60% of the city's residents are without main water. Many have to rely on bottled or trucked water; others are using wells. The United Nations Secretary General, Ban Ki-moon, said Tuesday that engineers were working to repair the pumping stations that bring in water from the desert, but it wasn't clear how long it would take to restore service. "The humanitarian situation in Libya demands urgent action," he said. Supplies are beginning to arrive. The World Food Program sent in a convoy from Tunisia, carrying water, medical supplies and blood. The main road between the Tunisian border and Tripoli appears to be more secure, while the World Health Organization is sending 45 tonnes of medical supplies, as Tripoli's seaport is open again. There are also other shortages -- especially of gasoline and cash. But the NTC is organizing tankers of fuel into the capital, and lines at gas stations (as well as prices) are now close to pre-war levels. CNN correspondents Wednesday reported that garbage collectors were out on the streets. The cash shortages at banks should be eased with the decision by the U.N. sanctions committee to release $1.55 billion in Libyan assets that were being held in Britain. While resistance from Gadhafi forces has effectively ended in the capital, it continues elsewhere with fighting reported in some parts of the country, most notably Gadhafi's home town of Sirte, Sabha and points to the south. The rebels have given pro-Gadhafi elements in Sirte, about 400 kilometers east of Tripoli, until Saturday to surrender or face attack. "Unfortunately, to preserve blood sometimes you have to shed blood," said the newly appointed deputy prime minister of the NTC, Ali Tarhouni. Sabha, deep in the desert, is an important junction leading to the Algerian and Chadian borders. Another pro-Gadhafi hold-out is Bani Walid, south of Misrata. Royal Air Force jets targeted three command and control buildings there on Monday. NATO has acknowledged that resistance from Gadhafi forces is not over. "The pro-Gadhafi troops that we see are not in total disarray. They are retreating in an orderly fashion," said NATO spokesman Colonel Roland Lavoie Tuesday. Gadhafi had the ability "to exercise some level of control and command," he said. On Wednesday, Saif al Islam Gadhafi, one of Gadhafi's sons still in hiding, broadcast a defiant message via a TV station in Syria. Gadhafi did not divulge the whereabouts of his father, but said, "The leader is fine. We are fighting and we are drinking tea and drinking coffee and sitting with our families and fighting." Saif said he was speaking from a suburb of Tripoli, but there was no way of independently confirming his whereabouts. It is unclear whether the remnants of the pro-Gadhafi forces will reorganize underground and begin an Iraq-style insurgency, or whether they will just melt away. While there is no occupying power to focus on, tribal and sectarian rivalries in Libya run deep. The rebel fighters don't exactly march in step. Different groups from different parts of the country patrol different parts of the capital. There is no overall command, despite the appointment of Abdel Hakimal-Hasadi to lead the Tripoli Military Council. Hasadi is also known as Abdelhakim Belhaj, a former jihadist who was an important figure in the militant Libyan Islamic Fighting Group. An effective military leader, Hasadi's past unsettles others in the loose rebel coalition. Some fighters have reached Tripoli from Misrata in the east; while some have come from the mountains to the south-west. There was little co-ordination ahead of their arrival in Tripoli. The NTC leadership in Benghazi tried to exercise some influence over the rebels in the west, but never had direct control over their campaign. Rifts within the NTC's military leadership were exposed in July with the murder of the overall commander, Fatah Abdel Younis. The NTC's investigation into his killing continues but has been shrouded in mystery; Younis' supporters say they want answers. Some of the NTC's Executive Committee and other senior officials are now in Tripoli; others are still in Benghazi or Doha in Qatar. There are clearly disagreements and competition among them for influence. The Financial Times reported Wednesday that there was a tussle for control of Libya's $65 billion sovereign wealth fund, with two different officials named to take control of it. Tarhouni, who holds the Oil and Finance brief for the NTC, has promised more clarity in coming days. The escape to Algeria of Gadhafi's wife and two of his sons, along with their families, has deepened the mistrust between the NTC and Libya's powerful neighbor. Algeria described the move as a humanitarian gesture, but it angered the NTC, with one official calling it "an aggressive act." The NTC has previously accused the Algerian government of supporting the Gadhafi regime; the Algerians have complained to the United Nations about damage done to their embassy soon after the rebels entered Tripoli. NTC officials are trying to play down any differences with Algeria. Tarhouni told CNN Tuesday that relations with Algeria were good, and the Algerian authorities would not permit Moammar Gadhafi to cross the border.